While flu this year may be mild, it’s all over the place. Whether you’re traveling to a winter wonderland or heading south to escape the snow, don’t let your trip be ruined by pathogens like cold, flu, or a stomach bug (like Norovirus). A safe trip starts before you leave, by keeping up healthy habits, like drinking lots of water, sleeping enough, and eating nutritiously. Don’t let last minute errands start your trip off on the wrong foot. And don’t forget to pack medications or supplements you take (like colloidal silver!). Once you’ve left the house, let the frequent handwashing begin. It’s probably the most effective thing you can do to prevent getting sick (that, and don’t touch your face—hand to eye/nose/mouth is a common way to transmit illness). 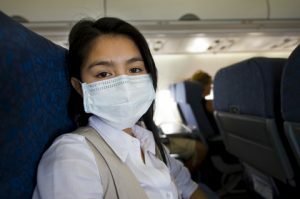 When you’re picking out your airport meal during layover, or picking a spot when you’re browsing a town on a road trip, pick a couple of back-ups and be prepared to do an about-face if there’s a sick employee. The food industry is notorious for not giving out sick days at a high cost to customers. Norovirus, flu, Hepatitis B, cold, or just a milder stomach flu are all a lot more likely if you see employees sniffing, sneezing, or just looking pale, sweaty, and miserable. It’s worth it to go somewhere else. Don’t forget to relax on your vacation. With cell phones and wifi, work tends to follow us, but don’t squeeze in too much. Getting sleep, balanced meals (not just holiday treats) and remembering to take your daily multivitamins/colloidal silver can all make a big difference to how well your trip goes, and how ready you are to get back to things when you return! Make sure you have enough colloidal silver before your trip, then enjoy the holidays and get ready for a happy and healthy 2017!